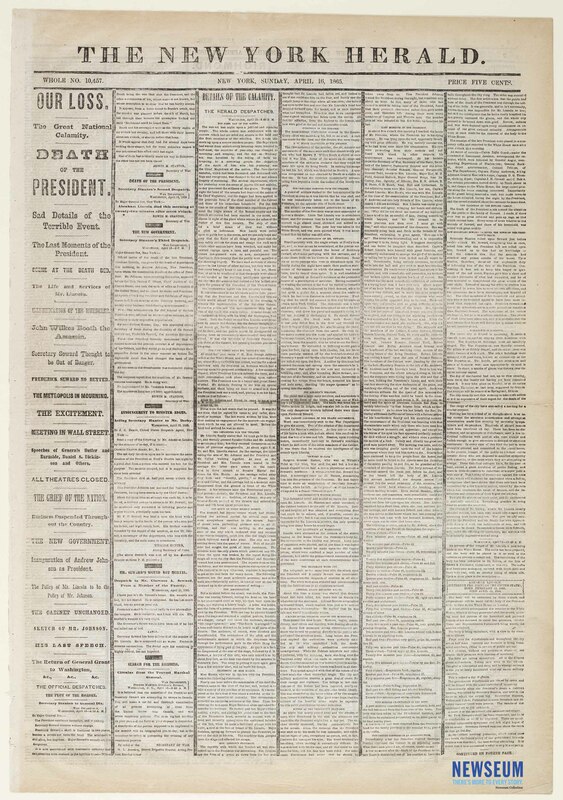 The front page of The New York Herald features nearly an entire column of bold headlines on the assassination of President Abraham Lincoln and the attempted assassination of Secretary William Henry Seward. The newspaper prints the dispatches from Secretary of War Edwin M. Stanton to Major General John A. Dix, the statement of witness Clara Harris, physician's notes on Lincoln's failing condition, public reaction to Lincoln's death, the search for the assassins, and the inauguration of Andrew Johnson. Known as "mourning rules," the wide vertical lines between the newspaper columns represent grief over the loss of an important person.